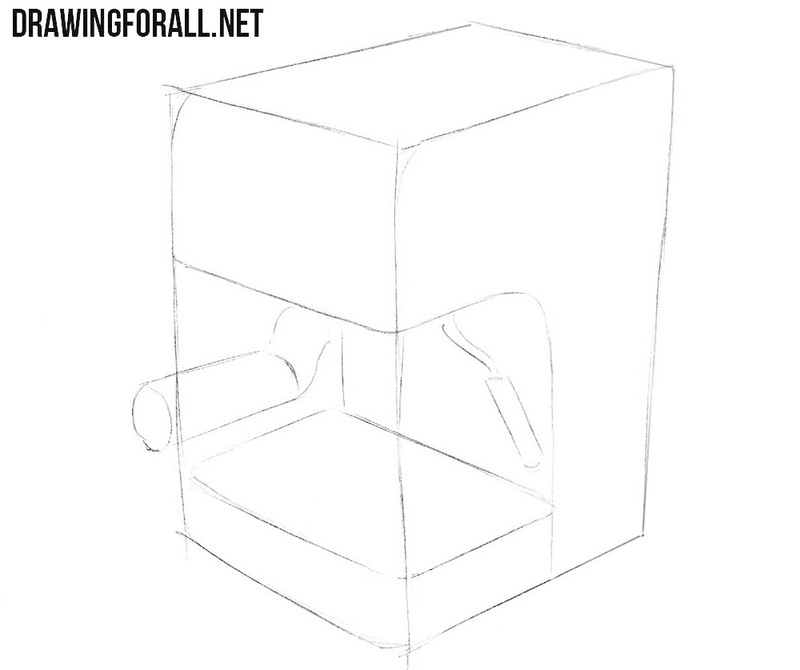 First sketch the coffee maker in the shape of a rectangular box. 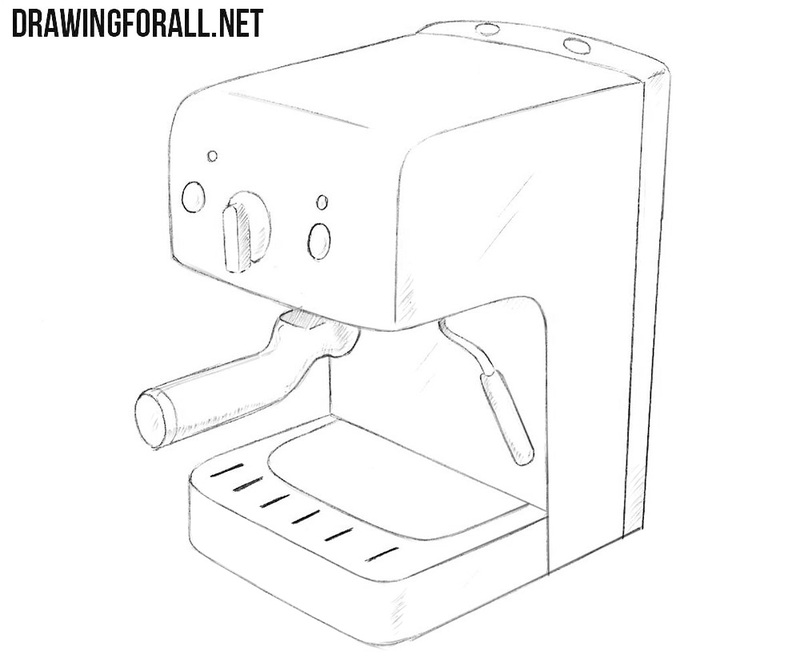 This will be an approximate basis for our coffee maker. 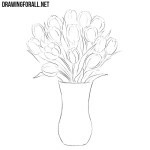 We always urge you, dear readers, to draw geometric shapes without the help of auxiliary tools. 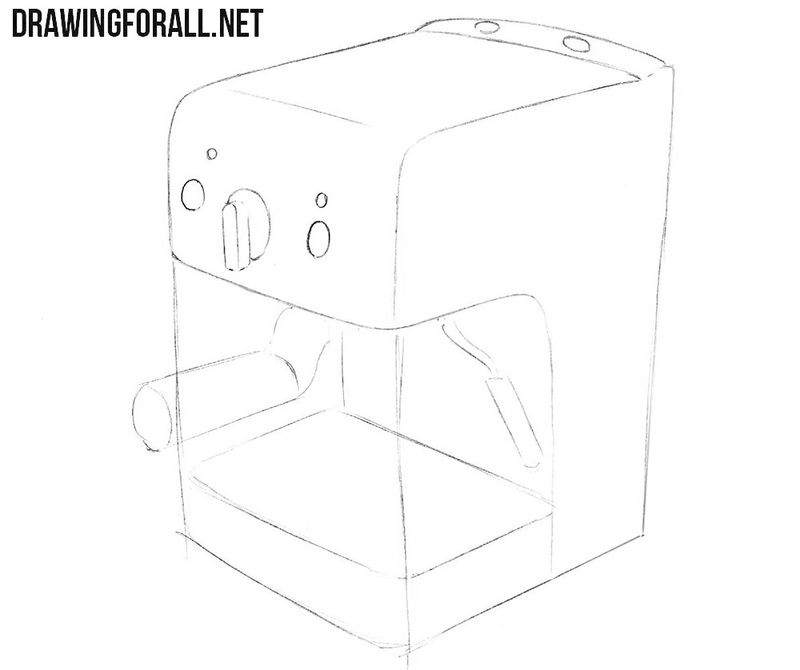 You can sketch the base for this coffee maker, using a ruler. 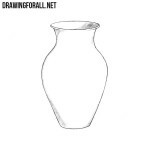 But you will improve your skill a lot if you draw it by hand. There are many models of coffee makers. Many of these machines have right angles. 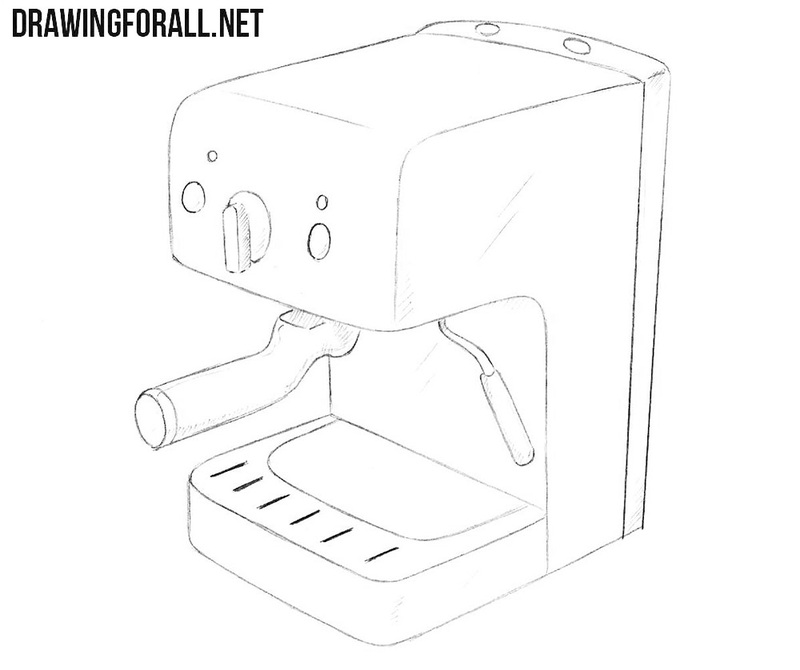 We chose to draw a coffee machine that has smoothed corners. So in this step, we draw the rounded edges, the outlines of the lever and the outlines of the tube. Draw in detail the buttons on the top and front panels of our coffee maker. You can arrange buttons and various indicators to your taste. 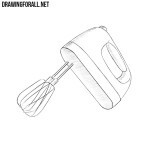 You can for example draw a touch panel or a button to launch a nuclear bomb. Draw out the details of bottom of the coffee maker. It usually looks like a grate and stand for flowing foam and liquid. In the same step we should draw the final contours of the lever and pipes for the finished coffee. In this step, we draw light shadows on the buttons of our coffee maker. More intense shadows should be drawn on the lever and on the upper part of the pipe. 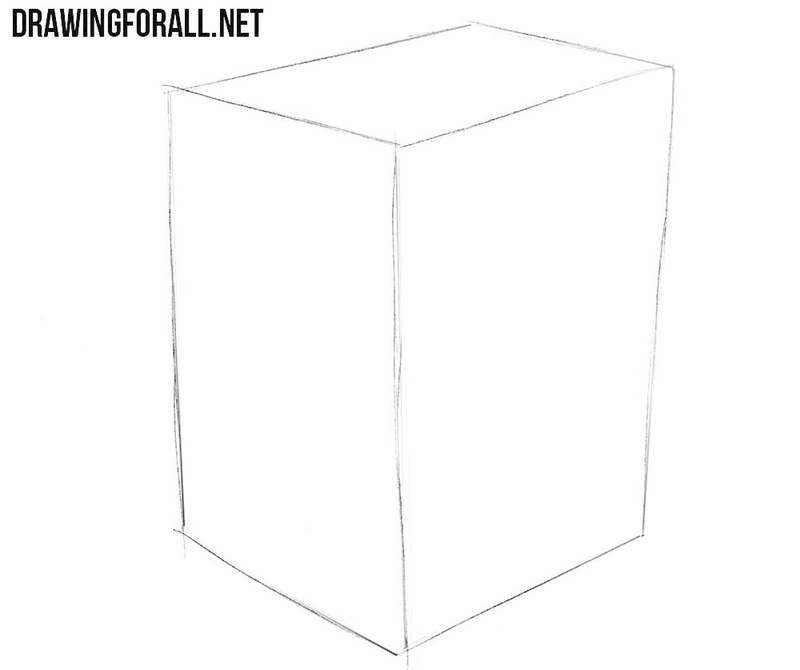 By tradition, we draw shadows with hatching, but you can make softer shadows by rubbing pencil lines. 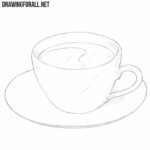 It was a fairly simple drawing guide, and we very much hope that now you have learned how to draw coffee maker. 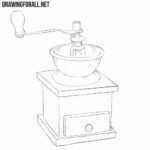 With this lesson we end a series of articles about coffee and about the things that are needed to make the perfect strong coffee. By the way, if you did not know, we have pages on all popular social networks. To keep abreast of all the new articles, subscribe to us, and to help us grow, share our tutorials with your friends and acquaintances. If we suddenly forgot something, please remind us in the comments. 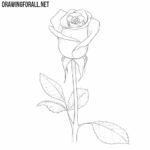 We will fix it and draw it.